Acid rain events in Yuebei, a region of northern Guangdong Province, China, have been increasing due to rapid urbanization in recent years. A three-year study was conducted to assess the effect of rainfall on losses of dissolved calcium (Ca2+) from limestone soils in a karst area in Yuebei. Soil leachate was collected from 61 events that produced more than 100 ml leachate per event during a 3-year period. Each rainfall event caused on average a loss of 8.5 × 10−4 g Ca2+ kg−1 soil with a Ca2+ loss of 2.16 × 10−5 g kg−1 per mm of rain. Cumulative net Ca2+ loss from the soil for the 61 events monitored was 0.05 g kg−1. In terms of Ca-loss per mm rain, the largest net Ca2+ loss from the soil occurred with mild acid rain (pH 4.5–5.6), followed by non-acid rain (pH 5.6–6.29) and severe acid rain (pH < 4.5). Net Ca2+ losses through natural rainfall were significantly larger than those induced by simulated rainfall with distilled water (control) or rainwater from the karst depression area of an adjacent talus slope. Total water soluble Ca2+ content in the soil continuously decreased due to acid rain, with a total reduction of 0.36 g kg−1 during the three-year experimental period. Net Ca2+ losses from the soil were positively correlated with leachate Ca2+ concentration and rainfall and negatively correlated with rainwater pH. 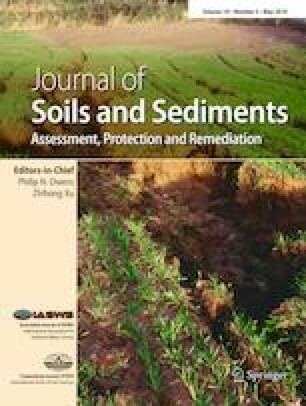 The losses of Ca2+ from the soil can increase the risk of acidifying soils in the flat karst area in Yuebei, which may also affect the adjacent regions through changing the chemistry of groundwater and surface water. The authors thank Li Lei (School of Geography, South China Normal University), Cuiyun Ye, Lixuan Xian, Lingjie Tan, and Yaowen Liu (Foshan University) for their assistance with the rainfall simulation experiment and data collection. This study was supported by the National Natural Science Foundation of China (41571091, 31700459, 21876027), the Chinese Academy of Sciences Action Plan for the Development of Western China and STS plan project (KZCX2-XB3-10, KFJ-EW-STS-092), and the Guangdong Provincial Research Centre of Ecological Civilization Construction.